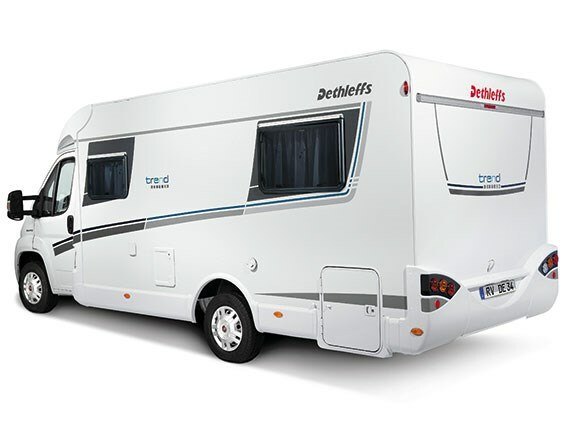 Dethleffs’ new Trend Edition is an interesting departure from the German manufacturer’s core business of large, bespoke motorhomes. At less than seven metres, the Trend is the company’s smallest model and could be billed as an entry-level Dethleffs for couples. 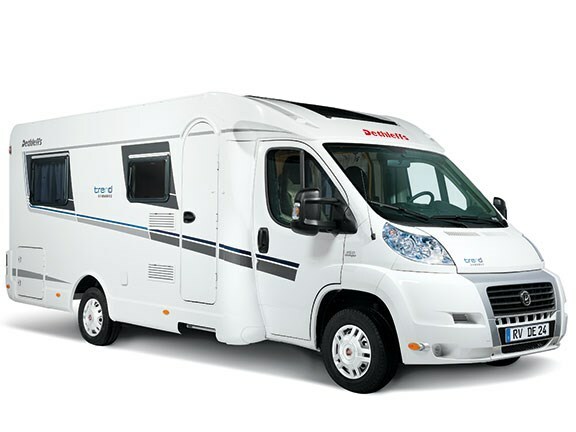 In addition to the downsizing move, Dethleffs has further broadened its potential market with the Trend by choosing to marry its reputation to the enormously popular Fiat Ducato chassis — and it's a happy blend. You get the Dethleffs quality and workmanship delivered on the easy-drive Ducato platform — capped off with the all-important affordability factor. The base model retails for $118,000. There are two Trend Edition models: the T6617 and T6857. Our review model is the latter. 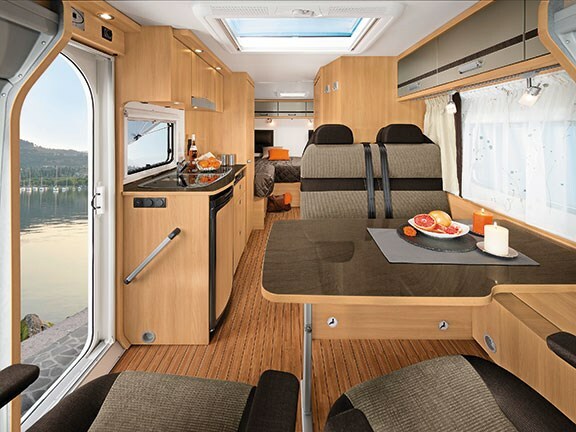 Both have the identical dimensions (6.98m long by 2.33m wide by 2.67m high) and have the same layout, but for the rear cabin — where the T6617 has two single beds (convertible to a double), the T6857 has a fixed island double. I prefer the fixed island bed configuration — no need to re-arrange cushions/mattresses to create a double bed. 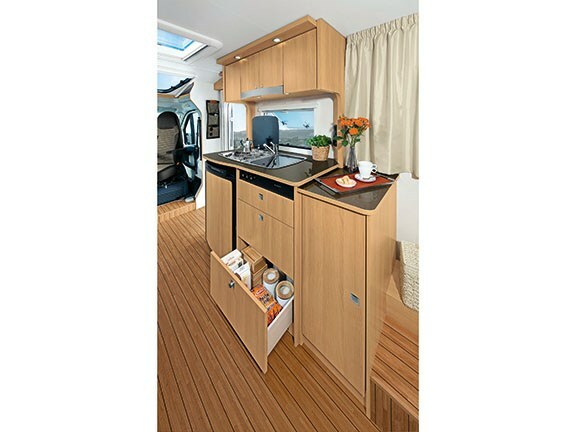 And while both designs offer plenty of storage space in the rear suite, the T6857's layout provides two hanging lockers/wardrobes. Both models have a small dinette up front and the seat's equipped with two seatbelts (ideal for two children). 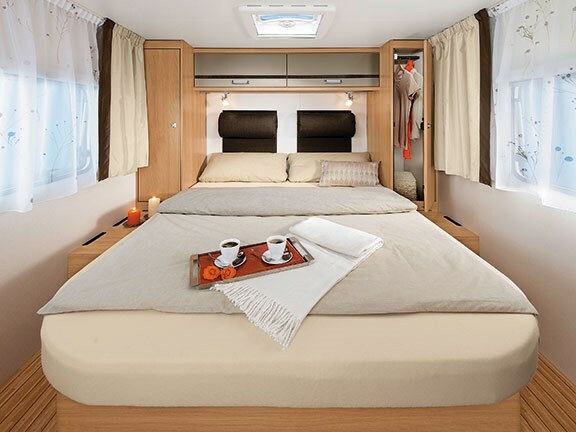 In conjunction with the drop-down table, the dinette deploys into a small double bed. While this definitely makes the Trend a legitimate small-family proposition, it's better suited to a touring couple. 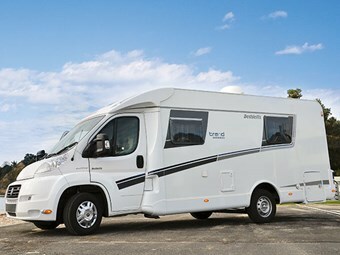 It's also a relatively lightweight motorhome: 2855kg with a 644kg payload. 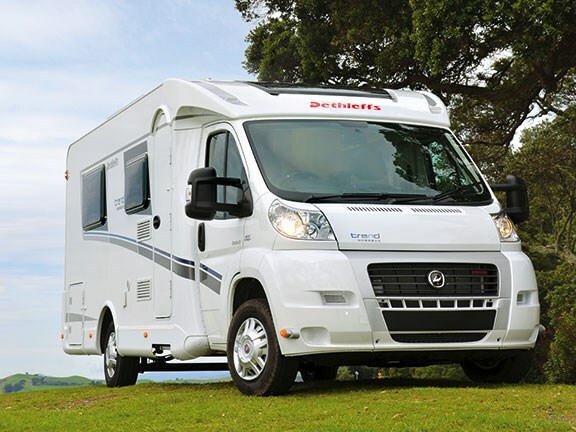 Where the standard Trend is fitted with Fiat's two-litre, 115hp powerplant, the New Zealand importer has opted to land these motorhomes with the bigger engine — the turbocharged, three-litre, 180hp model. It's mated to Fiat's Comfortmatic six-speed gearbox and, with the Trend's low and slippery aerodynamic profile, the engine purrs along effortlessly. As always, the Ducato driving experience is a pleasure, and with Dethleffs' rattle-free construction you won't have to crank up the cab's stereo volume. Smart use of space is a dominant Trend feature. My favourite is the cleverly-designed bathroom (a classically-themed white and silver-grey composition) with a swivelling divider wall. The wall contains a generous built-in basin and a large mirror, with the toilet to the right. Swinging the divider 90˚ to the right transforms the bathroom into a spacious shower cubicle, and also shuts off the toilet area, keeping it dry. Another space-saving accessory is the 6kW Truma Combi gas heater, performing two jobs in one. Nestled discreetly under the bed, it keeps the interior cosy as well as heating the water in the integrated, 10-litre cylinder. Winter touring won't pose any hardship — the Trend's construction includes double-glazed windows and polystyrol (EPS) insulation in the walls, floor and roof. Despite its modest size, the kitchen's perfectly serviceable for couples, though you'll want to use the built-in, hinged covers over the cooker and sink to extend work surfaces for seriously ambitious meal projects. The three-burner cooker (electric ignition) is complemented by a small oven and a 113L fridge (of which 14L is dedicated to the freezer). The Trend carries 125 litres of freshwater, with a 90-litre greywater tank. Again, while the dinette's compact, it easily accommodates four when you use the Ducato's swivelling front seats. The best part of the dinette, though, is the light. There's a large skylight overhead, with another even larger skylight further forward, over the cab. Natural light floods into the area. They are opening skylights, so ventilation won't be a problem on steamy days. And if the sun's too bright, pull out the concertina blinds. I particularly like the way Dethleffs does its lighting. While all the fittings are LEDs, many are mounted on tracks, allowing individual lights to be slid into optimum positions to cater for reading preferences or creating the right ambient tones. The LEDs do a good job of illuminating the interior. It has a crisp, modern feel — a blend of pale, Donau Acacia cabinetry, white ceiling, grey upholstery — all accentuated by that abundance of natural light. 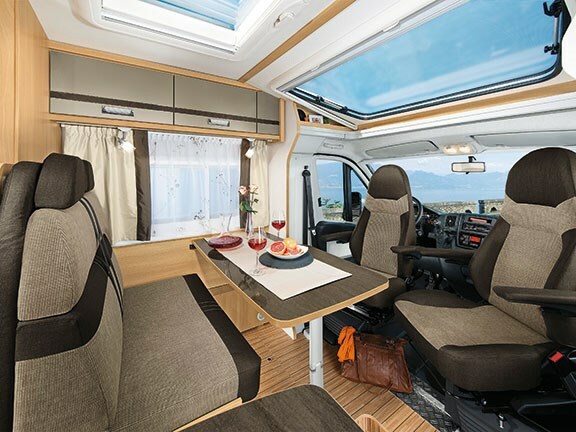 The Ducato's cab offers the usual features (air-conditioning and cruise control) and a host of ergonomically-positioned accessories, including a CD/MP3 player/radio and a LCD screen for GPS (it doubles as the viewer for the reversing camera). Optional extras range from a satellite TV dome and 140-watt solar panel. Couples with small children might be slightly compromised by the single TV — it's mounted in the bedroom. You'll have to balance TV watching and bedtime judiciously. Standard Trends are equipped with a 75Ah AGM house battery — those keen on extended freedom camping might want to boost that to a heftier model. But there's plenty of space in the gas locker — it accommodates two 9kg bottles. The Trend's most unusual feature is the main entry door: it's mounted on the opposite side, just behind the driver's seat. I can appreciate this works for European left-hand drive vehicles, but it feels a little awkward in a right-hand drive vehicle. It might take a little getting used to — and demand great care before exiting when you're parked on the side of the road. Overall, I like the little Dethleffs. It's simple but classy, with a great build quality and good design features. It's good value for money — and if you're thinking about joining the motorhome fraternity for the first time, well, you could do worse. 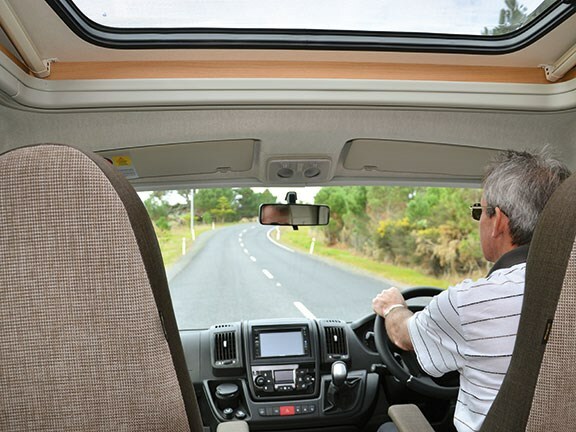 For more information contact Jonas on (09) 534 0823 or email sales@buycampervan.co.nz.